If you consider yourself to be a gym rat, you’ve likely encountered pre-workout supplements at some point or another. 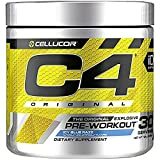 You’re probably familiar with the Cellucor brand, which is responsible for the C4 pre-workout supplements. This company has been in the field for a lengthy period of time and their supplements are highly regarded by bodybuilders and the like. The company offers a whole lineup of supplements and it is a good idea to learn about each. You’ll be able to do that by reading through the individual reviews below. 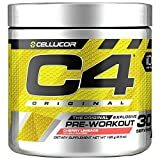 Those that wish to utilize an affordable, but potent pre-workout powder, will want to check out the C4 blend from Cellucor. The product is available in various flavors and each of them is incredibly delicious. This is especially true when it comes to the Icy Blue Razz flavor! With this flavor, you will never have to worry about gagging or cringing. This is a comprehensive blend, which delivers all of the benefits you need to power through your workout. It delivers enhanced energy, incredible focus, and massive pumps. Whether you’re trying to bulk up or slim down, C4 is definitely capable of guiding you in the right direction. All in all, the C4 Pre Workout is great. It is an excellent supplement, which is also affordable and fairly tasty. The product excels in terms of performance. Regardless of your fitness goals, you can guarantee that this product will help you achieve them much easier and more rapidly than you would believe! 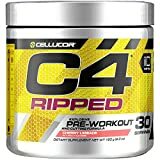 Cellucor C4 is one of the most popular pre-workout supplements on the market. It is exclusively designed for beginners and veterans, plus it is creatine-free. When combining creatine with caffeine, there is a much higher risk of CVA (cardiovascular accident or stroke). Just one scoop of the C4 will provide you with an abundance of benefits that will help you endure your workout. There is much to love about this supplement, besides it is suitable for male and female athletes. Overall, Cellucor C4 is rated one of the most popular pre-workout supplements on the market. 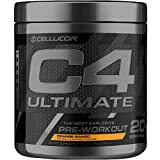 This updated C4 does not contain creatine but will provide you with the same or more benefits to help you endure an aggressive workout. Just take 20-30 minutes, prior to hitting the gym and enjoy. Are you looking for an incredibly safe, low-calorie pre-workout powder, which actually works? If so, you should definitely check out the Cellucor X4 50X! This product is a step up over the aforementioned pre-workouts in terms of performance and slightly in price. A single bottle can be utilized for 30 workout sessions and each serving contains just 5 calories. This helps to guarantee that you’ll be able to reap the benefits, without gaining a large quantity of weight. This supplement is made within a GMP compliant facility and has been tested for its safety. The comprehensive pre-workout supplement delivers everything you will need to get through your grueling workout. It delivers additional energy, immense focus, and unbelievable pumps. If you take the time to read this C4 Extreme review, you will find that the product is well received! Combines Beta-Alanine and Creatine Nitrate for effects you will feel! When it comes down to it, the C4 50X is definitely much more powerful than some of the other Cellucor products. It is low in calories and high in Beta Alanine, Creatine Nitrate, and the company’s own Explosive Energy Blend. This guarantees that you’ll be able to experience the pumps, energy and focus that you’ve always dreamed of! Be sure to check this one out for yourself right away! Each consumer is different and his or her goals and desires will be incredibly diverse. Some individuals will wish to lose an abundance of weight rapidly, while others will want to be able to build muscles and bulk up. If you fall into the latter category and want to get ripped, you’ll definitely want to invest in Cellucor’s C4 Mass Muscle Builder Supplement. This product delivers 30 servings per bottle. It’ll last a single individual for 30 workout sessions and will help to guarantee that each session is more intense and grueling than ever before. Take note that each serving delivers 25g carbohydrates and 60 calories. The combination is specifically designed to help the consumer gain muscle and should not be used by those looking to slim down. The supplement is made within a GMP compliant facility, so you can maintain your peace of mind when utilizing it. If you are an avid bodybuilder, you know how difficult it can be to maintain your muscle mass through so many strenuous workouts. This is where C4 Mass comes into play because it contains a CreaCarb blend of ingredients that actually work, as described by the manufacturer. It is great for the bulking phase, so be sure to add it to your daily regimen.